For the 24 hours to 23:00 GMT, the EUR remained steady against the USD and closed at 1.1466. In the US, data indicated that the US Dallas Fed manufacturing business index sharply declined to a level of -5.1 in December, more than market expectations for a drop to a level of 15.0. In the prior month, the index had registered a reading of 17.6. In the Asian session, at GMT0400, the pair is trading at 1.1445, with the EUR trading 0.18% lower against the USD from yesterday’s close. 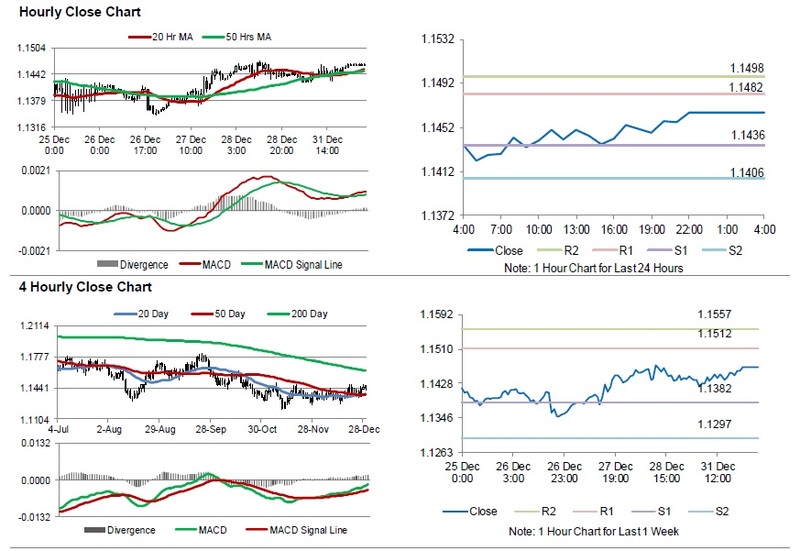 The pair is expected to find support at 1.1422, and a fall through could take it to the next support level of 1.1399. The pair is expected to find its first resistance at 1.1468, and a rise through could take it to the next resistance level of 1.1491. Looking ahead, traders would closely monitor the Markit manufacturing PMI for December, slated to release, in a while, across the euro-bloc. Later in the day, the US Markit manufacturing PMI for December, will pique significant amount of investors’ attention. The currency pair is trading above its 20 Hr and 50 Hr moving averages.